Displaying image 88 of 200 images in Physics. 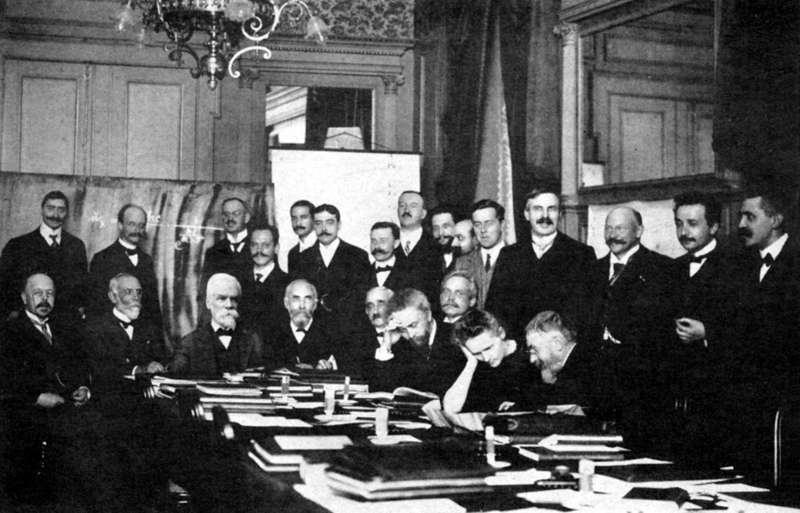 Seated (L-R): Walther Nernst, Marcel Brillouin, Ernest Solvay, Hendrik Lorentz, Emil Warburg, Jean Baptiste Perrin, Wilhelm Wien, Marie Curie, and Henri Poincaré. Standing (L-R): Robert Goldschmidt, Max Planck, Heinrich Rubens, Arnold Sommerfeld, Frederick Lindemann, Maurice de Broglie, Martin Knudsen, Friedrich Hasenöhrl, Georges Hostelet, Edouard Herzen, James Hopwood Jeans, Ernest Rutherford, Heike Kamerlingh Onnes, Albert Einstein, and Paul Langevin. Photograph was taken by Benjamin Couprie, 1911, published not long afterwards. PD in USA because of age. Ernest Solvay (1838-1922) was a Belgian chemist and industrialist whose patents brought him considerable wealth, which he used to bankroll several philanthropic endeavors. In 1894 he founded a sociology institute at the University of Brussels, called "Institut des Sciences Sociales" (ISS). In 1903, he founded the Solvay Business School, also at the University of Brussels. Finally, in 1911, he established the prestigious meetings of top scientists known as Solvay Conferences. The first and the fifth of these (1911 and 1927) are particularly noteworthy, as they helped define the foundations for the first and second incarnations of quantum theory. In his letter of invitation dated June 15, 1911, Ernest Solvay explained that he conceived the first meeting as a Conseil scientifique international pour élucider quelques questions d'actualité des théories moléculaires et cinétiques. Arthur Schuster, Joseph Larmor, J.D. van der Waals and Lord Rayleigh were originally invited but could not come. They were replaced by Edouard Herzen, Georges Hostelet, Martin Knudsen and Frederick A. Lindemann. Poincaré had been omitted from the list drafted in May by Walther Nernst but this was soon corrected. The meetings took place from Sunday, October 29 to Saturday, November 4, 1911, but the conference itself lasted only from Monday to Friday. The proceedings were published in 1912 by Maurice de Broglie and Paul Langevin. Each participant received 1000 francs from Solvay for travel expenses. Ernest Solvay himself was not present when the above group photo was taken. This is why his head appears noticeably larger than it ought to... His portrait was crudely pasted on before the picture was released. There may have been a stand-in for Solvay when the photo was shot and whoever did this clumsy doctoring made absolutely sure that Solvay's head was larger than the face it had to hide!